In physics, wavelength is the distance between repeating units of a propagating wave at a given frequency. It is commonly designated by the Greek letter lambda (λ). Examples of wavelike phenomena are light, water waves, and sound waves. The properties of a wave vary with the type of wave. For example, in a sound wave, the air pressure oscillates, but in the case of light and other forms of electromagnetic radiation, there is variation in the strength of the electric and magnetic fields. The wavelength (and frequency) of visible light varies with color of the light. For example, the wavelength of deep red is roughly 700 nanometers (nm), that of violet is roughly 400 nm. The wavelengths of sound frequencies audible to the human ear (20 Hz–20 kHz) are between approximately 17 meters (m) and 17 millimeters (mm). Thus the wavelengths of audible sound waves are much longer than those of visible light. The wavelength of a wave (or wavelike phenomenon) is related to the frequency by the formula: wavelength = wave speed / frequency. Thus, the wavelength of a wave is inversely proportional to the frequency of the wave. Waves with higher frequencies have shorter wavelengths; those with lower frequencies have longer wavelengths, assuming the speed of the wave is the same. 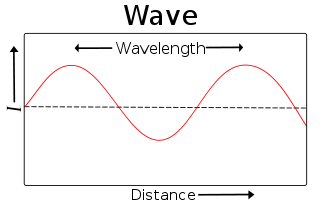 where λ represents the wavelength, v is the propagation speed of the wave, and f is its frequency. In the case of electromagnetic radiation, such as light, in a vacuum, the velocity of the wave is the speed of light, 299,792,458 meters per second (m/s) or about 3×108 m/s. For sound waves in air, this is the speed of sound, 345 m/s (1238 km/h) in air at room temperature and atmospheric pressure. Usually, SI units are used, where the wavelength is expressed in meters, the frequency in Hertz (Hz), and the propagation velocity in m/s. For example, the wavelength for a 100 MHz electromagnetic (radio) wave is about: λ = 3×108 m/s divided by 100×106 Hz = 3 meters. Electronic engineers often use a shortcut formula: wavelength λ in meters = 300 Megameters (Mm)/s divided by the frequency in MHz, to avoid counting the (many) zero digits in the decimal or scientific notations. It should be noted that for many wave phenomena, wavelength is not the distance that particles travel during a period. For instance, in acoustics and water waves, the particle displacements during a period are only a small fraction of the wavelength, apart from extreme conditions like breaking waves and shock waves. It should also be noted that frequency and wavelength can change independently, but only when the speed of the wave changes. For example, when light enters another medium, its speed and wavelength change while its frequency does not. where n is the refractive index of the medium. Wavelengths of electromagnetic radiation are usually quoted in terms of the vacuum wavelength, unless specifically indicated as the "wavelength in the medium." In acoustics, where a medium is essential for the waves to exist, the term wavelength is always the wavelength in the medium. Then the refractive index depends on the mean properties of the medium, for instance the mean pressure or changes in the material composition. where h is Planck's constant, and p is the momentum of the particle. This hypothesis was at the basis of quantum mechanics. Nowadays, this wavelength is called the de Broglie wavelength. For example, the electrons in a CRT display have a De Broglie wavelength of about 10-13 m.
↑ In terms of frequency, the range is 430–750 Terahertz (THz). This page was last modified on 10 August 2013, at 16:12.